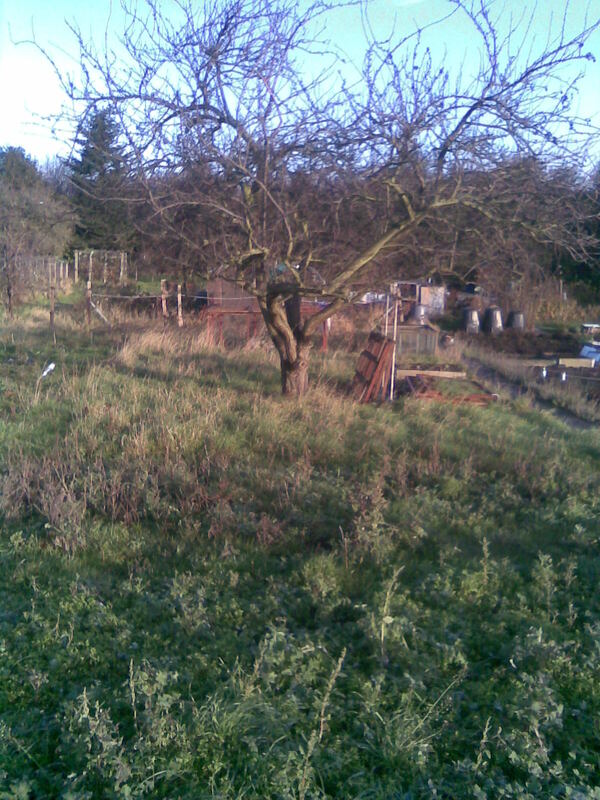 The tree in the middle is a plum tree. 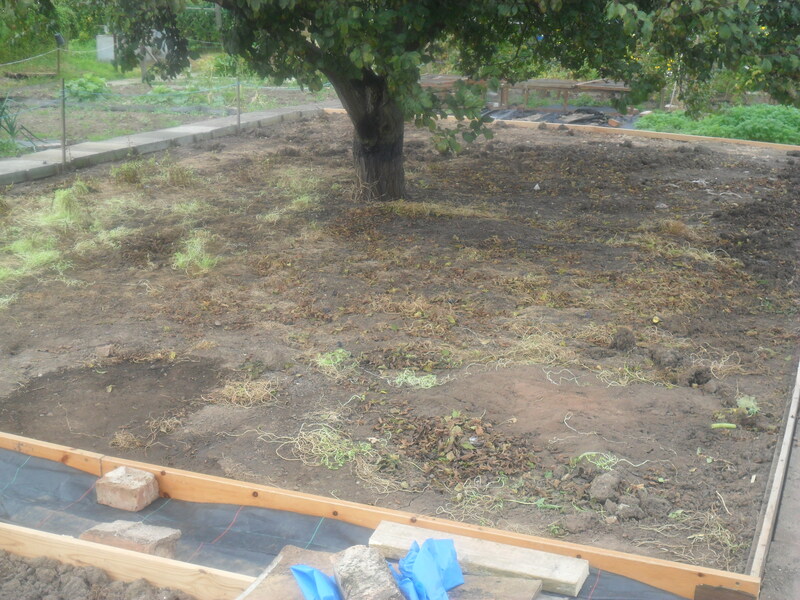 The previous plot holder, Eric, had tried to grow vegetables under the tree, but he told me that nothing grew properly as it was just too dry and shady under there. After I had strimmed the couch grass and weeds in January, I covered it all with weed suppresant. 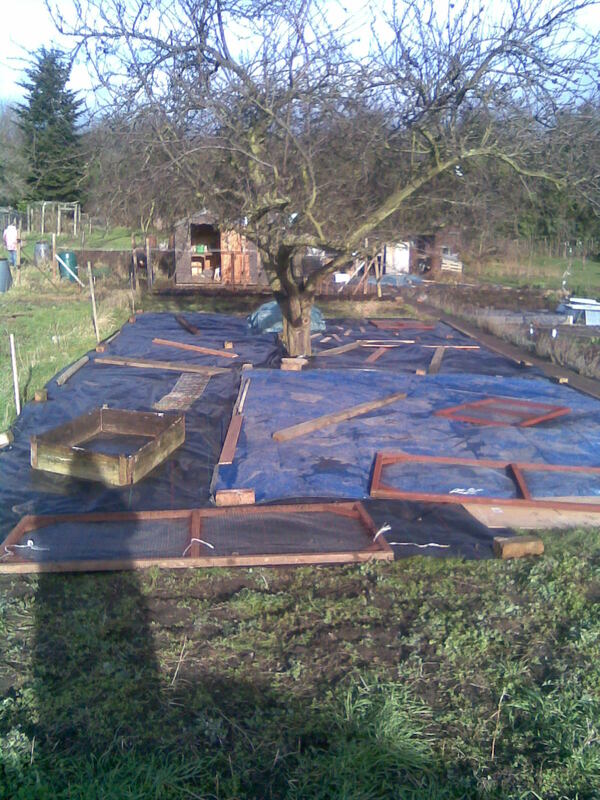 Last year, my dad had given up his allotment, as it was just too much for him. He asked if he could have a little bit of my plot to work. I thought this was a wonderful idea, as I can’t think of anything better than having my dad growing his vegetables with me, as I think the world of my dad. 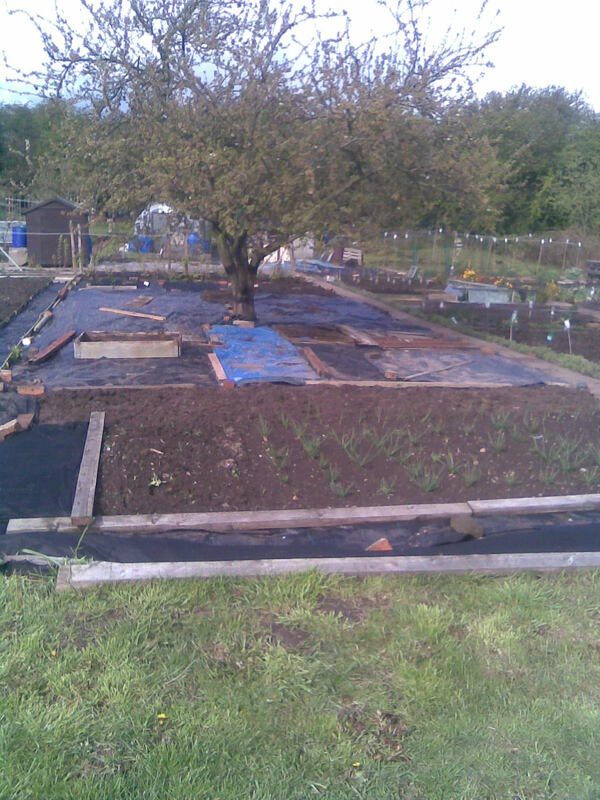 So in April, I dug a patch at the front of the plot, removing all the weeds and added loads of compost. 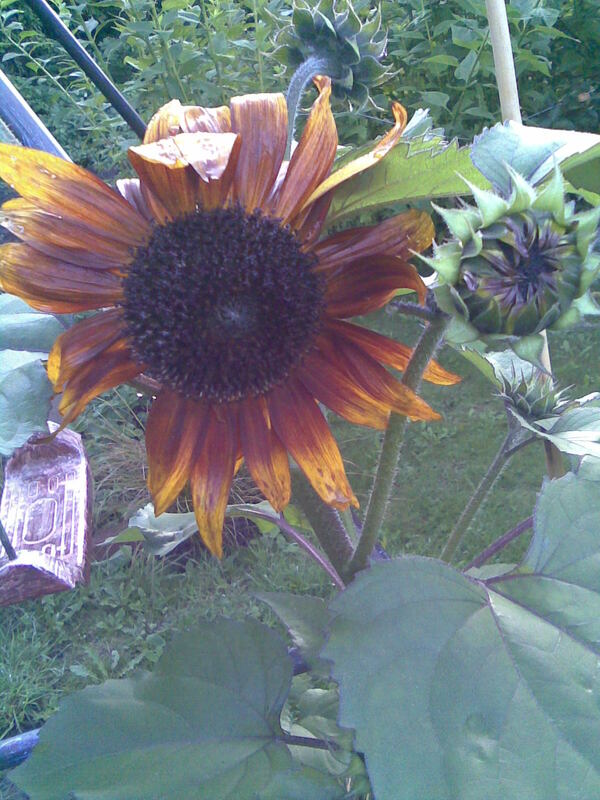 Dad has grown leeks, runner beans, onions, lettuces and squash this year. I have been worrying about the weed suppressant around dad’s patch, as I have bricks and old pieces of wood holding it down and I have worried that dad would trip over them. 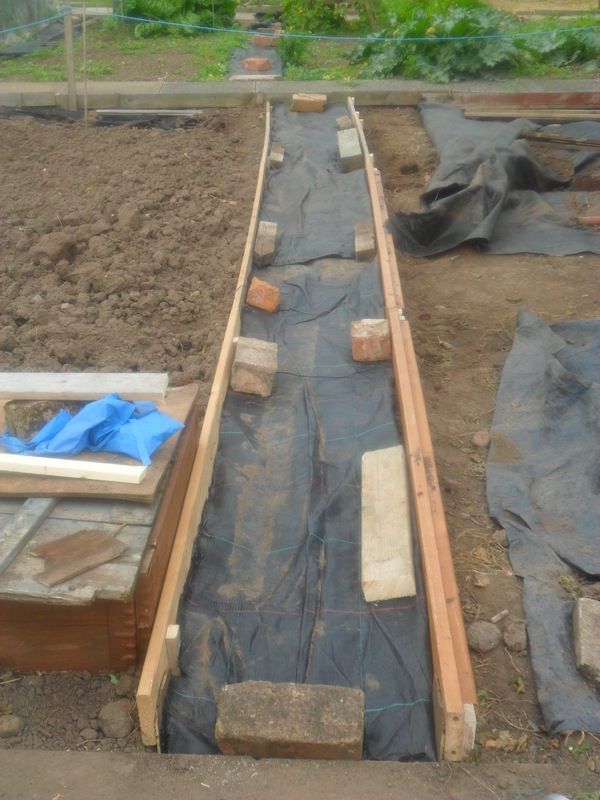 So this week, I have used old pieces of wood, to make the edge for two paths and I have laid weed suppressant in between them. Next week I will be visiting our local council to buy some wood chips to put over the weed suppressant. 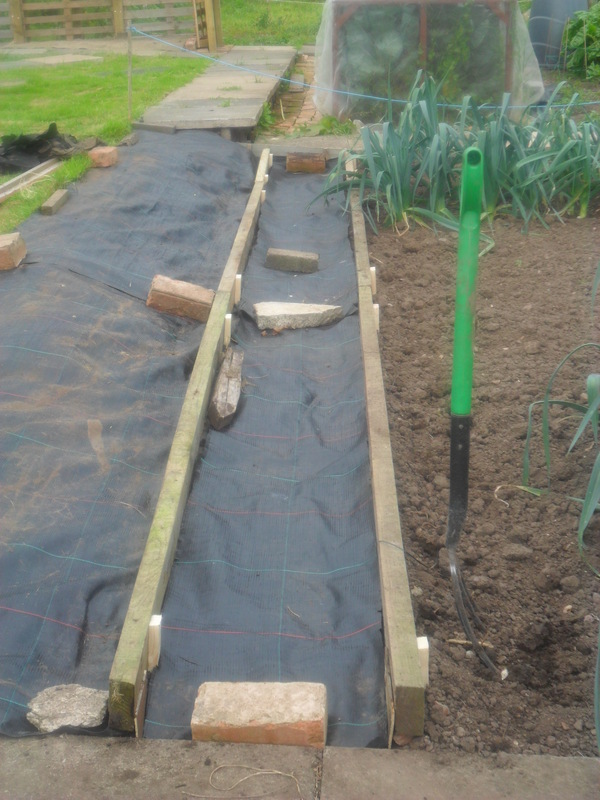 The bricks etc are just there to stop the weed suppressant from blowing away in the wind. They will be removed when I put the wood chips down. In the photo below, you can see I have also put wood around the edges of the tree. I have decided that this area is going to be a woodland area and I will continue to work on it over the next few weeks. I removed the weed suppressant from around the tree this week and you can see that all the couch grass and weeds have been killed. I have some bulbs to plant and I will be on the lookout for some cheap woodland plants or plants that I can take cuttings from, to fill this area. For a while now I’ve been making laundry liquid to wash my clothes. Today I made some more, as I had run out. It washes well and is so much cheaper than shop bought wash powders and liquids. I really don’t know where I got the recipe from, it was somewhere on the net, so I can’t take any credit for it. 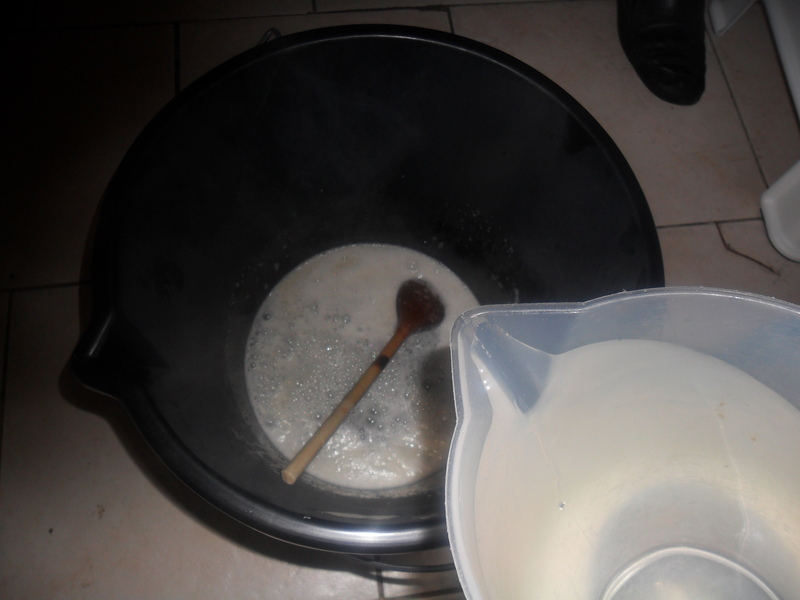 Pour the mixture into a very large bucket and then add 8 litres of cold water. I use old plastic milk containers to store my liquid in. The recipe makes just over 10 litres of liquid. The above amount will last quite some time and washes well. You won’t see lots of bubbles when it washes, but this doesn’t matter. Wash powders that you buy actually have bubbles added, not because thay are needed, but because people think their clothes aren’t washing properly if they don’t see bubbles. I think its great what you’ve done for your Dad! Just great. I haven’t seen a drink despenser exactly like that one either, but it gives an idea, and then you work with it, eh? Mrs Yub, I had a look for one of these and found they were all above £20, out of my price range I am afraid. Then got thinking – all that is needed is a tap on a container i.e. wine in a box. I wonder if these can be repurposed – obviously when they have been emptied, by you or by your friends lol. If any one tries it would they let us know? I have enjoyed catching up with what you are doing in plot number four, and how wonderful to be sharing it with your father. 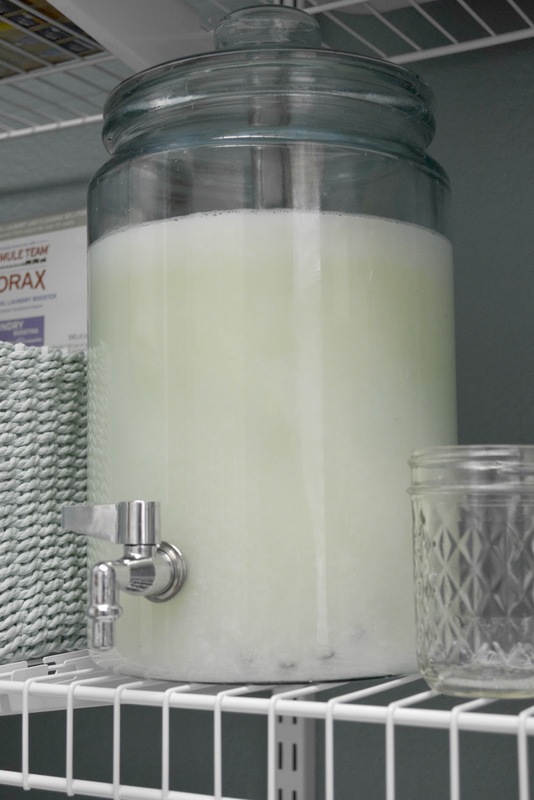 Thanks also for the laundry liquid recipe, I’m always interested in ways to cut down on the chemicals in my home. I’ve been drying to decide wether or not to buy Soap Nuts as an alternative to washing powder but I might just give this recipe a try first since I have all the ingredients to hand. Thanks for the tip, hopefully I’ll be back to let you know what I think. Hi Miss Penny Pincher. I have also tried soap nuts but I found they didn’t wash as well as I expected, but I do like my laundry liquid but I know everyone is different. I have terrible excema which is why I tried the soap nuts but I find my skin is fine with the laudry liquid too. Let me know how you get on. Where do you get borax substitute from?I have dried tesco and wilkinson s ! Hi Louise, Wilikinsons used to sell it but I haven’t see it for a while there. I usually buy it on-line from either Amazon or E-bay, but shop around for the best price. Is there another name for the borax substitute please? I also cannot find borax here in Ireland anymore! Let me know if you manage to find some. I buy 3 x 500g boxes from Amazon for £6.24p inc postage . That’s as cheap as I’ve found it . 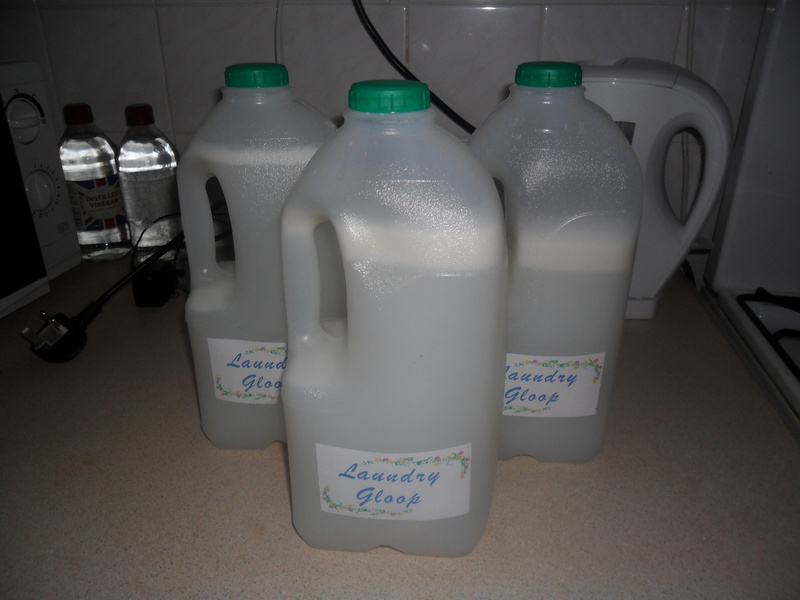 You’re very welcome , I’m a Newbie to this make it yourself laundry and multi purpose cleaners .I have found it fascinating to read into and very inexpensive and good for the environment ,I’ve ordered all manner of items to make my own . Something about brightly coloured spray cleaners that promise the earth , we all need to be re-educated regarding our cleaning habits , maybe if the off the shelf products had to carry health warnings etc ? But for me I’ve started my own cleaning revolution , I just wish I’d found out about the alternatives a lot earlier . well I think you are making a great start! Yesterday I ordered 1kg of Soapnuts ( I’m trying everything ) I ordered from a company called Salveo , they were £9.79p inc free delivery , I thought it reasonable then today on Ebay the cheapest I found was £7.99p inc. delivery ( and 3 x washbags thrown in ) While £1.80p difference isn’t the end of the world, there’s something in being content in the knowledge you have bought a product at the best possible price , so if anyone is going to re-order soapnuts – Ebay is the place . 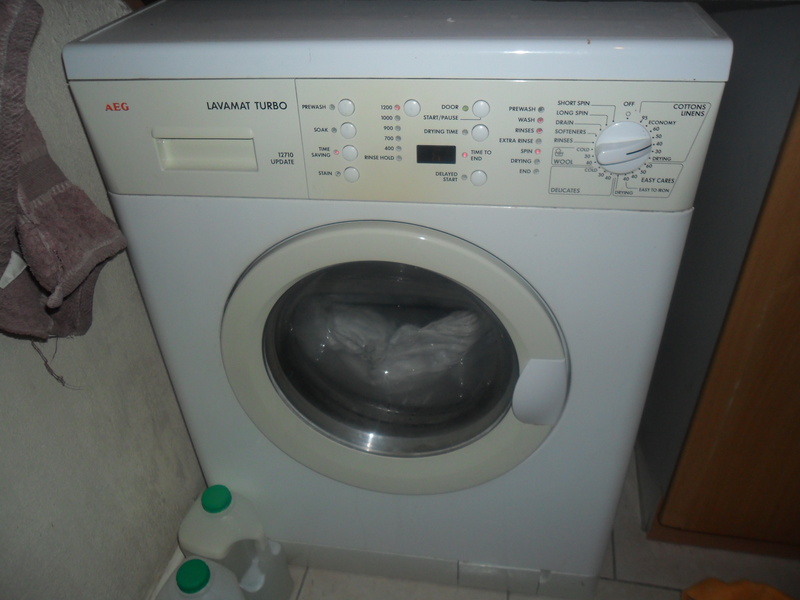 Yes will do , I recently made Laundry washing powder , consisting of 5 ingredients : Washing Soda – Borax Substitute – Baking Soda – Sunlight Soap and Oxy clean ( optional ) So far the results are very good . 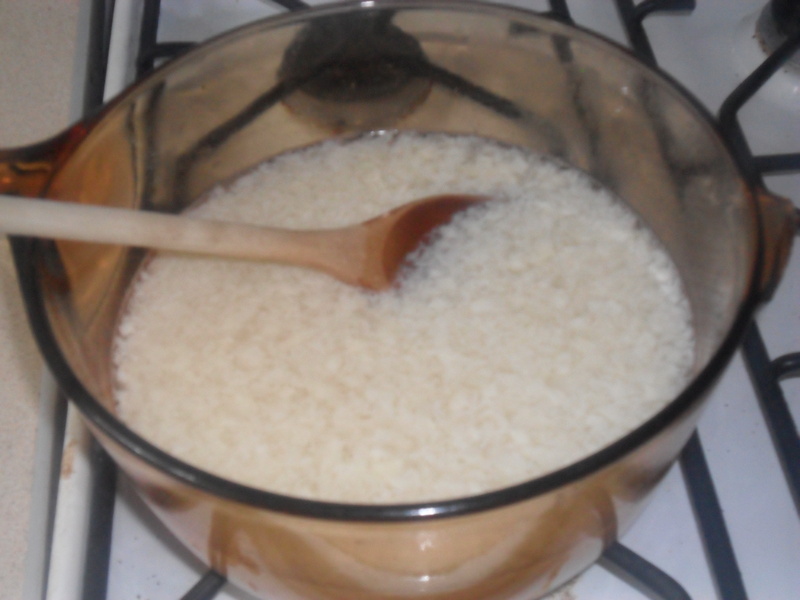 I’m going to be experimenting with all kinds of recipes with good results ( hopefully ) . 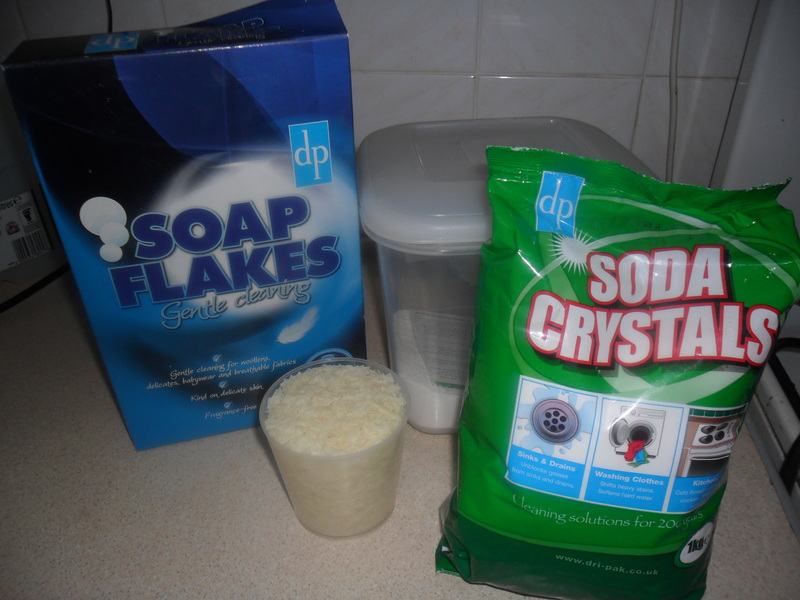 I would like to know where in the uk at a reasonable price you can buy soap flakes? NOT the liquid kind!!!!! I find that ordinary soap grated up does NOT work well enough for me! Hi Sarah. I’m sorry to hear you are having a problem with ordinary grated soap….I have been in touch with the company that used to sell soap flakes and unfortunately they have discontinued the product so they are no longer availiable in the UK. The company suggested we now use liquid soap flakes but I think these are expensive so I now use grated soap and I have been happy with the results. Have you tried a different brand of soap? I’m really sorry I can’t help you any further….let me know if you find a solution.